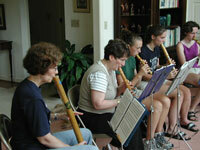 The American Pipers Guild, founded in 1991, promotes the making and playing of bamboo pipes. The beautiful sound of pipes has drawn the attention of many good composers. Ralph Vaughan Williams wrote a suite for pipes and eventually became the President of the Pipers Guild of Great Britain. Others who have composed music for pipes are: Imogen Holst, Michael Head, Elizabeth Poston, W. S. Lloyd-Webber and Betty Roe in Great Britain, Claude Arrieu and Claude Pascal in France, Tera Oyens in the Netherlands, Bernard Reichel and Curdin Janett in Switzerland, F. X. Frenzel in Austria. Works are still commissioned for various events. Recorder, krumhorn, organ and other instrumental as well as a wealth of vocal music from a variety of time periods is frequently suitable or has been arranged for pipes. They have been combined successfully with such folk instruments as a dulcimer, banjimer, guitar, psaltery, Celtic harp, hurdy-gurdy to name a few. Workshops are offered from time to time to make pipes. Once you have made one, you can become a member of the American Pipers Guild and join in its activities at a very low cost. Free open rehearsals are offered in Hartford, Connecticut every week. A newsletter, The Pipeline, is published periodically, which contains articles about pipers and their endeavors. For more information, get in touch via the Contacts page.